An alternative to the sweet pancake, our savoury recipe is a truly versatile treat! However you pack your pancakes, why not try our simple savoury pancake recipe and fill them with a variety of your favourite ingredients. 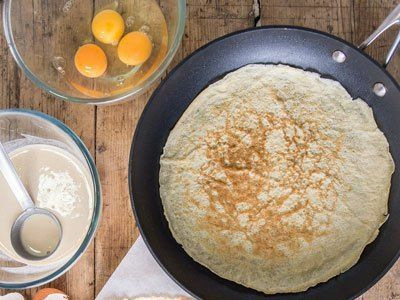 Ham and cheese are classic favourites but whatever you choose, follow our savoury pancake recipe and make suppertime special. Sieve the flour into a large bowl and crack in the eggs. Use a whisk to gently stir until and slowly add the Carnation Evaporated Milk. Whisk until smooth and then add the cold water. When the edges start to lift and the centre starts to bubble the pancake is ready to be flipped. Use a spatula to turn the pancake and then cook the other side for another minute. Turn the pancake out onto a plate and keep covered whilst making the rest of the pancakes. Adjust the hob temperature if necessary. If your pancake mixture has a few lumps then pour it through a sieve into a clean bowl or jug to remove them.